Hungry Hungry Husky food truck has served Northeastern University students on campus since November 2011. The tantalizing aromas of earthy empanadas and tangy barbecue chicken mingling in the air lure a small crowd to the rumbling, bright red truck parked smack in the middle of Northeastern University’s Snell Library Quad. Outside the Hungry Hungry Husky food truck, students and professors jockey to scan the menu. Reaching up to a delivery window for a heaping tray of pita chips and some fresh guacamole, Lauryn Coccoli gushes, “Ah, you’re the best, thank you so much!” She is met with an appreciative nod by a worker inside the school’s food truck. “Whenever he’s here, I’m here,” says Coccoli, a graduate student at Northeastern. “It’s absolutely convenient, cost-effective, and the food’s great; it tastes better and is cheaper than in there,” she says, gesturing to the Curry Student Center, which houses nearly 10 food court eateries. 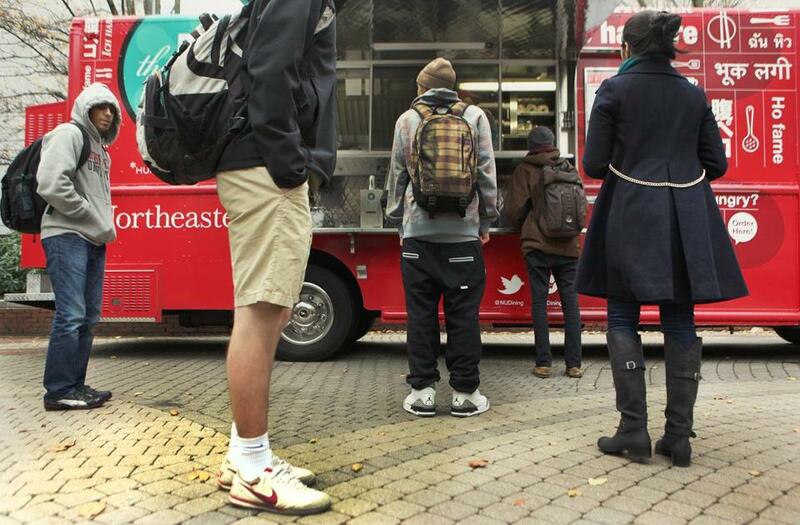 Northeastern and the University of Massachusetts Amherst have food trucks and Boston University is trying to start one, joining a national trend of colleges launching their own. The mobile eateries, which have exploded in popularity in cities around the nation, provide a great solution for colleges with centralized dining and decentralized dorm accommodations, giving food programs new income streams and helping them hold onto student food dollars that might otherwise be spent elsewhere. It also happens at a time when colleges, with their surging tuition costs, are expanding amenities amid tougher competition to attract and keep students. “It’s a matter of convenience; it’s a matter of bringing services right to the students. If we could make the truck be closer to residential buildings, you could come down in your jammies and get something later in the day,” says Barbara Laverdiere, director of dining services at BU, currently spearheading the school’s effort to establish its own food truck. Laverdiere explains the appeal of university-run trucks as multifaceted, with convenience, variety, and flexibility at the helm. Around Boston, Northeastern was the first to institute its own food truck, debuting Hungry Hungry Husky (H3) in November 2011. Northeastern’s director of dining services, Maureen Timmons, says she often looks to the West Coast for culinary inspiration. Doing so in 2009 led her to the mobile food trend. She noted that students flocked to the gourmet trucks doling out ethnic meals at reasonable prices, particularly around the University of Southern California and the University of California-Los Angeles. “We thought, why can’t we do that? It seemed like a fun way to deliver food to the students and meet them where they are.” Timmons set the gears in motion, and in about two years, H3 was up and running. “It’s been great. Students are always interested in more variety, [and the food truck is] fun and playful, and a little more exciting,” says Timmons. Last fall, UMass Amherst introduced the Baby Berk food truck, featuring a menu of gourmet burgers. “It’s a very versatile vehicle that’s convenient for customers,” says Ken Toong, executive director of auxiliary enterprises at UMass Amherst. Toong cites the famed Los Angeles food truck Kogi Korean BBQ-to-Go as his inspiration for bringing mobile food to UMass. The trucks, which serve far fewer customers than traditional dining halls, are able to be more flexible with menus and can provide more cooked-to-order offerings. The popularity of food trucks has surged countrywide in recent years after originating on the West Coast. College food-service managers around the nation also spotted the trend and over the past five years, universities from Seattle to Tuscaloosa, Ala., began scrambling to institute their own mobile eateries. The phenomenon is spreading so quickly, in fact, that it’s difficult to accurately track it, according to Rachel Warner, director of communications and marketing at the National Association of College and University Food Services. “It’s still a relatively new trend in the college and university market, [but] in the last couple of years, food trucks have really taken off,” says Warner, estimating their on-campus presence to have been roughly “fewer than a dozen five years ago [but] as many as 100 now.” Warner’s group represents more than 550 colleges throughout North America. Aramark, a food service company for more than 600 colleges throughout the country, first introduced a collegiate food truck in 2010. This fall, the company brought an additional 10 food trucks to college campuses, nearly doubling their presence within a year. Now, 22 campuses under Aramark are served by food trucks. Company officials say they typically contract with a truck provider and share revenue with the school. Bon Appétit Management Co. provides culinary services to about 100 colleges around North America. Of its collegiate clientele, three universities have food trucks in operation, two schools are close to rolling trucks out, and an additional handful are in early discussion stages. The appeal of food trucks to students is apparent, but there is also a financial incentive for the colleges. Besides additional revenue from regular walk-up customers, many college food truck programs allow students to use special dining plan credits or, in Northeastern’s case, retail Husky Dollars to buy meals; other schools including UMass-Amherst do not. Still other colleges, such as Massachusetts Institute of Technology, allow independent trucks on campus and benefit in other ways. The initial necessity has since blossomed into a mobile eatery row, where four food trucks (Momogoose, Jerusalem Café, Clover Food Lab, and José’s) reign supreme. Myers says that these trucks pay monthly rent on stationary spaces. Like most independently run food trucks, none of the mobile retailers surrounding MIT accept the college’s Tech Cash or any other form of university food credit. BU is in the midst of preparing to launch its own food truck, Fan Boy, which will feature a menu of Asian fusion recipes and has already arrived on campus. But the vehicle remains dormant and unused, attesting to the obstacles that can face mobile eatery start-ups. Clearly, the campus food truck movement shows no sign of slowing. “There’s a cool factor related to food trucks right now,” says Laverdiere.